Hello ... Hello ... my old friends ... It's great to see you once again! 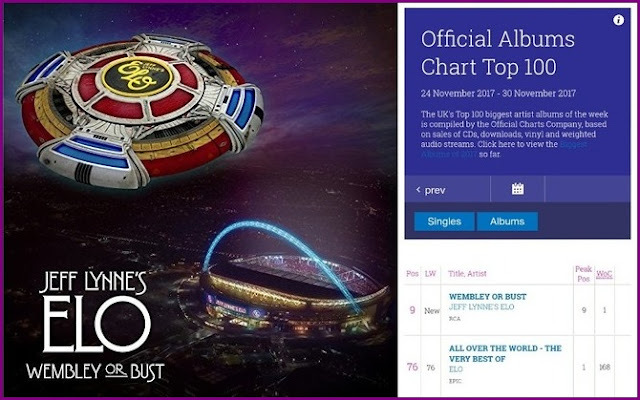 Having entered the Official UK Midweek Album Chart at #5 earlier this week, the new Jeff Lynne's ELO album "Wembley Or Bust" has been confirmed this evening as a new entry at #9 in the Official UK Album Chart - matching the chart performance of "Balance Of Power" back in March 1986. The impressive 3LP edition of "Wembley Or Bust" has also entered the Official Vinyl Albums Chart Top 40 at #7 so it's a triple celebration for the ELO maestro with million selling compilation "All Over The World" also confirmed as holding steady at #76. 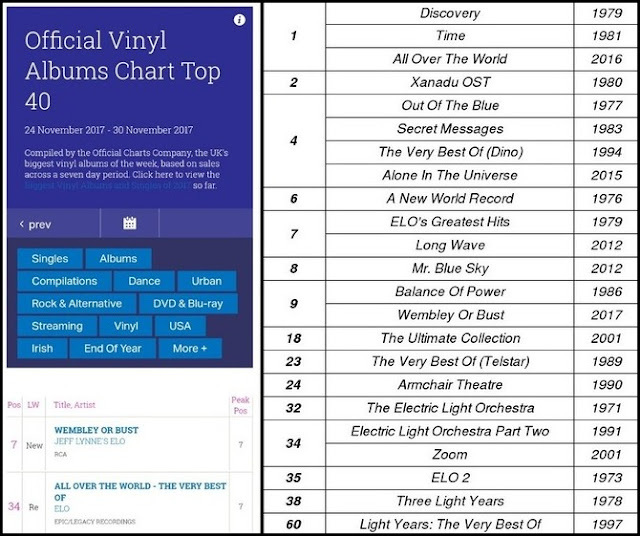 With Roy Orbison's orchestrated epic "A Love So Beautiful" still in the Top 10 at #7 and Bryan Adams' "Ultimate" compilation sitting at #31, it means that Jeff Lynne has a hand in four UK Top 100 albums at present! elobeatlesforever (elobf) recommends "Wembley Or Bust" by Jeff Lynne's ELO to those enlightened folks who enjoy the music of ELO, Jeff Lynne, Roy Wood, The Move, The Idle Race, 'Brum Beat', The Beatles and related artistes.